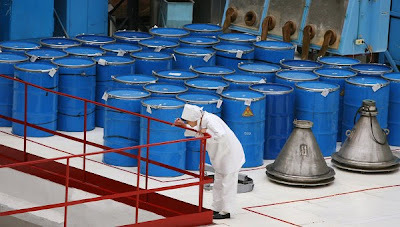 MOSCOW, Russia -- Moscow and Kiev intend to establish a Russia-based joint venture on uranium enrichment, the head of the state nuclear corporation Rosatom said on Friday. "We are working on the establishment of a commercial enterprise on uranium enrichment as part of the integration of Russian and Ukrainian nuclear centers," Sergei Kiriyenko said. The new joint venture will be similar to the one established by Russia and Kazakhstan in Angarsk in East Siberia. he said. In May 2007, Russia and Kazakhstan signed an agreement on the establishment of a uranium enrichment center in Angarsk, 120 km from Lake Baikal, to enable countries, including Iran, to develop civilian nuclear technology without having to conduct their own enrichment activities.